We will visit Alaquàs’ Urban Gardens with regularity to compare its evolution with our School Garden. The Greek Recycling Organization decided to install a retailer for the recycling of aluminum, plastic bottles and bottles in the yard of the municipal Nursing Home for the Elderly. 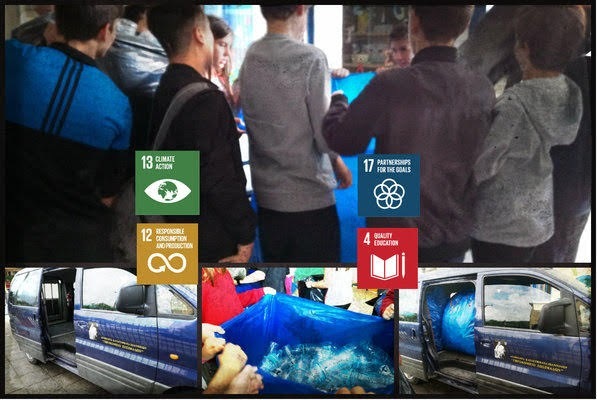 We all supported the operation of this program by collecting plastic bottles throughout the school year and offered them, in order to contribute to the protection of the environment and to the strengthening of the operation of the Foundation, as the revenue from this facility will be available for the reinforcement of the Nursing Home for the Elderly. 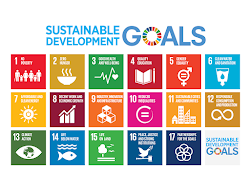 Thus, we served Goal 12: Responsible Production and Consumption, Goal 13: Climate Action, Goal 4: Quality Education and Goal 17: Partnerships for the Goals. Road safety is a great subject in which to engage student for their life benefit. We tried to approach it, in order to get a lot from studying and campaigning for road safety, because it is an issue they can understand and that affects them. 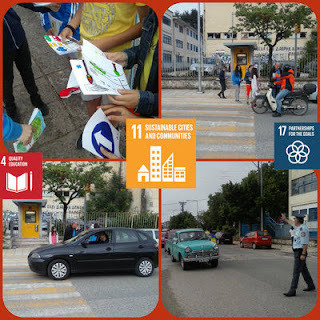 So, our students have designed and painted brochures about road safety and, then, since road safety skills are best learnt in the real traffic environment, with the help of the Traffic Police and their teachers, they distributed the brochures to the passing drivers outside our school. In order to raise awareness of the issues of right road behavior and especially of the drivers’ obligations, we served Goal 11: Sustainable Cities and Communities, Goal 4: Quality Education and Goal 17: Partnerships for the Goals, while becoming aware of how students can manage their own safety and become safer road users. In the context of the modern image of a sustainable world, the students constructed a model of an urban environment based on two parts. On the right, the city looks like the real one today (with gray colors and black buildings) and, on the left, as they ideally dream it (with colors, trees, parks, friendly public transportation etc.). This creative procedure served Goal 11: Sustainable Cities and Communities, in a teamwork that tried to transform our nearby world. Let’s learn and create eco-technologically! In recent years, man is increasingly involved in processes that require modern technological knowledge, such as the use of technology products (use of television, PC, car), involvement in issues related to the natural environment (overconsumption of water, depletion of energy resources). As students we must have basic technological knowledge, so that using technology as a tool, we can judge the alternatives available to us and make the right decisions. Under the supervision of our teachers, we firstly studied the case of any technological achievement and, secondly, we created a miniature of the ones mostly interesting to our environmental concern. Specifically, by studying some of the energy features (conservation-conversion-downgrading) we focused on renewable energy. 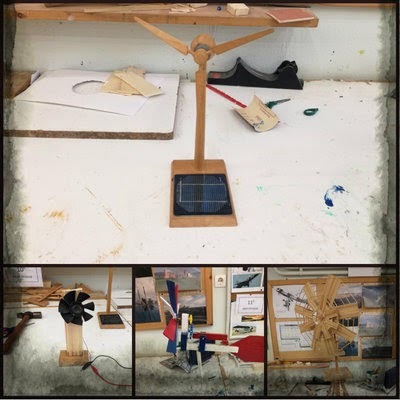 With the help of a photovoltaic we saw the transformation of the solar energy into electrical and then kinetic, as well as the conversion of wind to kinetics and the dynamics of water to kinetics. 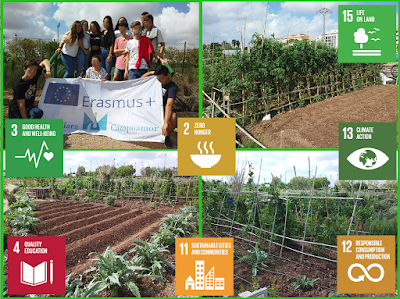 We finally constructed with simple materials machines that work with the above energy conversions, according to the “Agenda 2030” and, especially, Goal 7: Affordable and Clean Energy, Goal 13: Climate Action and Goal 4: Quality Education. Nelly and César, two Spanish students are living in Berlin and going to courses to the Carlo Schmid Oberschüle. They started their mobility the 20th August and will be there until October when will be the mobility in Germany. Nelly has sent us a video where she tells us their first 15 days in Berlin and tell us how the experience is going. 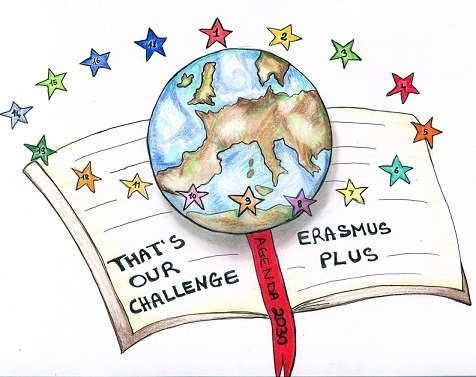 César has also sent us his video explaining his experience. 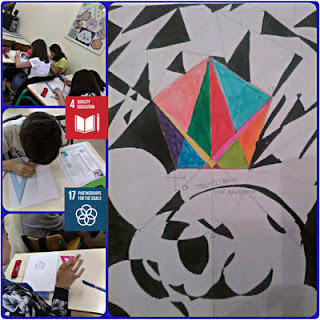 One action of collaboration between the Mathematics with the Filanagnosia (Literature) Clubs of Creativity and Excellence in our school, continued their cross-curricular interaction. Group students collaborated creatively to design the cover of their fantastic personal book, according to their environmental interests. "With a ruler and a compass" but also with inspiration and imagination, they visualized their reading experience in original artwork of covers, completing them with titles. Their participation was very enthusiastic and the result imaginative. 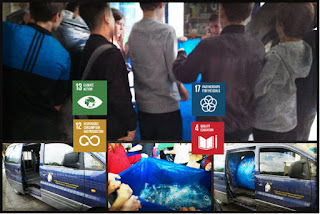 Thus, we served Goal 4: Quality Education and Goal 17: Partnerships for the Goals, as well as dissemination, since it was all presented in other school classes and Clubs.